Malta' Parliament consists of 65 members elected by universal suffrage. The electoral system is that of Proportional Representation. The President of the Republic is chosen by Parliament. Elections are held every five years. The latest three elections have shown that the people are more or less equally divided in their allegiance to one or the other of the two main political parties. The Labour Party and the Nationalist Party. The Maltese are very politically conscious and the temperature of factional passion is ever on the high side, particularly so at election time. Trade Unions in Malta, already developed during the time of British Colonial rule, plays a considerable part in Malta's social and political life. The largest single union is the General Workers' Union, and the other main is the 'unjoni Haddiema Maghquda '(United Workers' Union). Compared to most Western countries, salaries and wages are on the low side. Though considerable effort has been made, not without a degree of success, to keep down the cost of living in so far as most essential items are concerned, employees and workers often find it difficult to keep up the comparatively high standard of living which they were used to during the boom of the first post-war decades, before world-wide inflation inevitably affected a country which has to import nearly all its requirements from abroad. Social Services have in some measure lightened the burden of the lesser-paid workers, the pensioners and the unemployed. Some of the streets have recently been renamed. Britannia Street in Valletta has become Melita Street; Prince of Wales Road and Victoria Avenue in Sliema are now respectively Manwel Dimech Street (after an early Maltese militant Socialist) and George Borg Olivier Street (after the Nationalist Prime Minister who was in office when Malta became independent in 1964). Having to surrender, Malta's main solicitude now is the maintenance of peace in the Middle Sea. No one wants to return to the era when the economy of these islands was almost exclusive1y conditioned by the fact that they were a military stronghold. It is now universally accepted that progress and welfare may only be secured if our sea is what has been termed 'a lake of peace. It is against this background that one can understand why a people, though practically defenseless on their own, are wary of entering into military alliances or of accepting the presence of military bases on their shores. Why they are anxious to remain on friendly terms with other lands far and near, big and small. For a number of decades, in fact for a century and a half, things proceeded their merry way under British rule in Malta. However, there were rumblings that began to be heard and that eventually culminated in what came to be regarded as the peaceful acquisition of independence of the Maltese Islands and Maltese people from Britain. The process takes some patient re-tracing. For centuries, the majority of the people, kept at the basic level of survival, had little leisure to enjoy the finer things of life. They also had little time, mercifully, for reflection on their sorry plight as a colonized people. However, the very few that did, began to question the state of things. And their conclusion was that the state of the nation or rather the colony of Malta under the British was very convoluted indeed. For one thing, there had always existed a strong pro-Italian community in Malta whose sympathies lay with the language of Dante as well as with the descendants of Romulus and Remus as a nation. The segment of the nation with this strong Italian sentiment was further abetted with the arrival in Malta of Italian refugees fleeing the repercussions of the upheavals concomitant with the vicissitudes of the various wars and movements in the peninsula: Garibaldi is said to have sought asylum in Malta and so did Pius IX, though on different occasions and for different reasons - and not together. However, this periodic influx of outsiders, opened up the educated Maltese upper-class who had long affected an Italian mode of living besides using Italian as their means of communication. Such pin-pricks at the Empire did not sit well with the British who would have preferred a more homogeneous, therefore more controllable population. Opening up linguistic frontiers also opened up mental ones and the reformist mentality that was sweeping over certain parts of Europe could not help have some impact on the Maltese intelligentsia (what little there was of it in the shape of lawyers and doctors and clergymen) if no one else. Another pro-foreign faction in Malta had strong ties with the French language, culture, literature and mode of living. In spite of the bad taste that the French two-year presence on the islands had left in the hearts and minds of many in Malta, there were still those who had taken to the French and who had even migrated to that land of free speech and liberal illuminee thinking. All this necessarilv meant that such as these were unsympathetic to the British presence in Malta and, unkindest cut of all, held the Marseillaise in higher esteem than the God Save. To add to all this convoluted melting-pot, there were the varions handfuls of promising and deserving Maltese intellectuals who had been rewarded by the British Administration with stints of further civilizing studies in the Mother Country. Besides being reinforced in the belief of the supremacy of the British way of life as they gratefully applied themselves to their particular fields of study hack in England, such individuals could not help noticing that over there, there was such a thing called Parliament. In fact, England boasted of being the country where true parliamentary procedure first saw the light of history. These Maltese in England also noticed that Parliament there had a bigger say in the running of the country's affairs than anything the Maltese as a nation had back in Malta. The 1964 Independence Constitution, under which Malta was a constitutional monarchy and parliamentary state, was amended in 1974 to make Malta a republic within the Commonwealth. Its head of state is a president appointed by the Maltese Parliament, which is elected by universal adult suffrage for a term of five years and is basically derived from the British model. Local features include a single chamber with 69 members, while election is by proportional representation from 13 electoral divisions. An amendment adopted in 1987 guarantees a majority of seats to a party receiving more than 50 percent of the total votes in the general election. 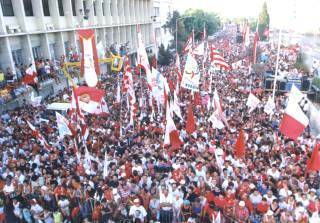 The two major parties are the Nationalist Party and the Malta Labour Party. The president acts on the advice of the Cabinet, which consists of the prime minister and other ministers (some assisted by parliamentary secretaries) and is collectively responsible to Parliament. There is no municipal government in the islands. The Nationalists were returned to power in 1987 with a policy of seeking full membership in the European Community and transforming the economy into a modern, technologically oriented structure. Malta's growing international importance was acknowledged when it was chosen as the site of the first summit meeting between Soviet President Mikhail Gorbachev and U.S. President George Bush in 1989.